This home is a must-see, must-have! 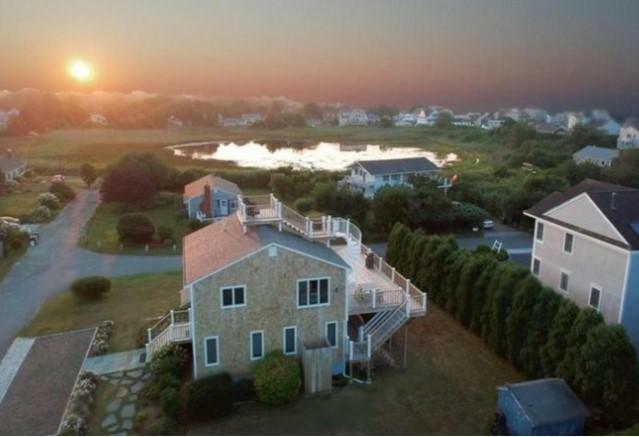 Centrally located on a large, corner lot between Surf Drive Beach, the Shining Sea Bikeway and Falmouth Village, you'll be all set to enjoy complete vacation-mode here. The interior has been designed with an open, airy living space on the second floor that is perfect for entertaining friends and family or just kicking back on a lazy summer day. It's move-in ready! Custom-milled wainscoting and crown molding complement the newly remodeled kitchen and bathroom. Expansive, outdoor decking dramatically enhances the beach vibe and provides vistas that are the envy of the neighborhood. Enjoy panoramic views of Vineyard Sound and see if you can spot the four lighthouses viewable at night from the rooftop perch. This home boasts over 15 years of steady rental history which makes this home even more attractive (detailed history available)! Make sure to view our virtual tour/video and schedule your appointment soon! Data current as of 2019-04-26.